Before the Aphasia Center of West Texas existed, stroke and other brain injury survivors coping with aphasia had little to no on-going support after rehabilitation therapies ended. Families were overwhelmed, and individuals faced a life of extreme frustration plus a cascade of losses beyond impaired speech. That dire predicament led to a regional “barn raising”—community leaders, healthcare professionals, and investors who came to understand the plight of West Texas citizens. They stepped up with their time and money to create the Aphasia Center of West Texas, located in Midland, TX. In the process, West Texas became home to the second independent non-profit aphasia center in the country, serving individuals who struggle with conversational interactions as well as the ability to read and write. 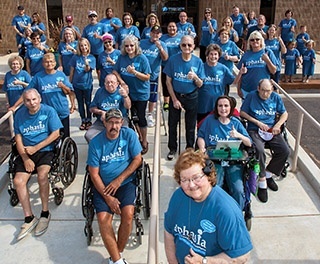 For nearly 15 years, the Aphasia Center of West Texas has grown deep roots, helping both the average citizen and the people directly impacted by aphasia to make environmental adaptations and learn the essential strategies it takes to navigate life in spite of aphasia. “We know that aphasia does not end when rehabilitation therapies conclude. At the Aphasia Center of West Texas, we give people the tools they need to deal with the misperceptions of others, re-engage in friendships, and get back to the interactions and activities that are important to them,” said Beth Crawford, M.S., CCC/SLP, Program Director. At the center, individuals with aphasia and those who care about them receive professional information about what they face, hope from a network of peers who have adapted to living with chronic communication challenges, and on-going “communication workouts”—opportunities to interact with benefits similar to what one would get from a physical workout at a health club. For every life interrupted by aphasia, the Aphasia Center of West Texas hosts conversation groups, computer labs, expressive arts, adaptive cooking, book club, music, and more. These groups occur both within the adaptive environment necessary at the center, as well as out-and-about activities to educate others and grow confidence going to the region’s public spaces again. The Aphasia Center also delivers customized trainings for healthcare, civic, and religious groups, which helps West Texas continue on the road to becoming the communication-accessible region they strive for—a region that truly embraces the diverse people who live there.